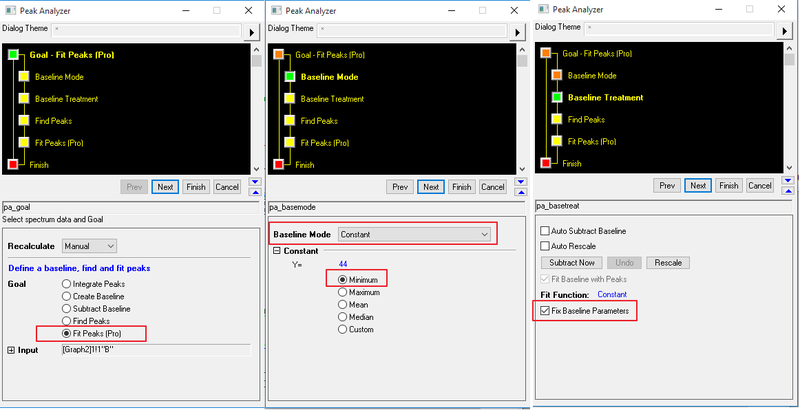 Origin’s Peak Analyzer is a powerful tool to perform peak analysis of many different user scenarios. 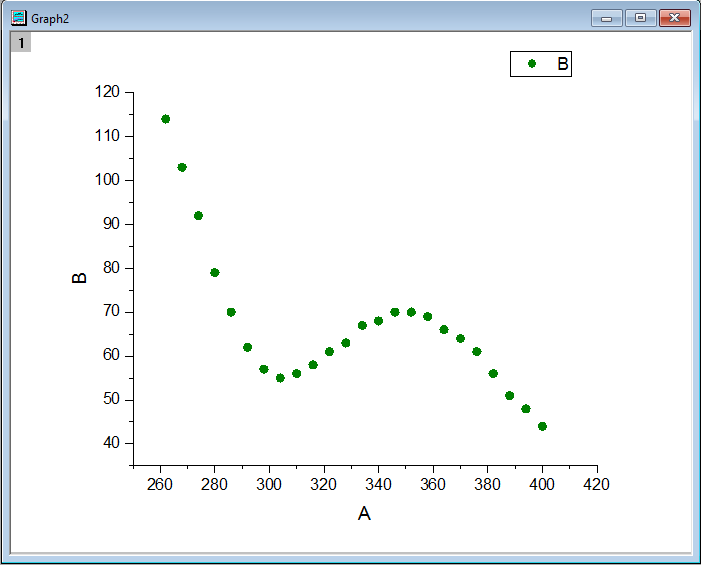 For example, in the graph below, there is a peak located near x=260 but data points are not available for the entire peak. 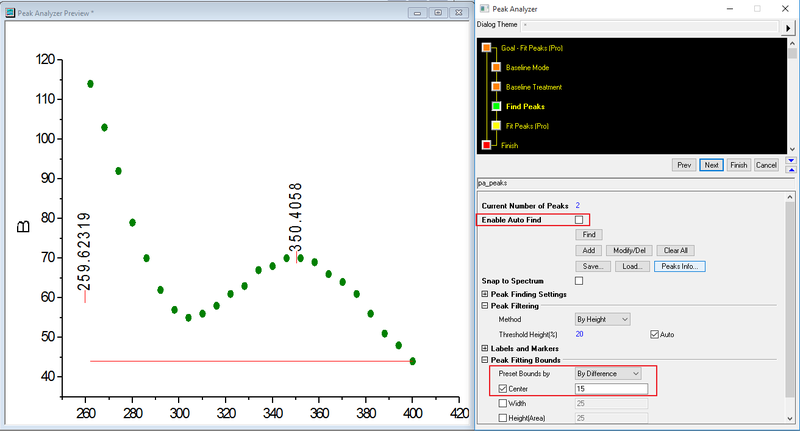 With proper bounds set on peak center, user can still fit such partial peak data. This blog shows how to achieve this step by step. Please download the opj file. In the data folder of the project is the dataset and graph that you will need to start with. You can also go to the result folder for the final fitting result. 1. 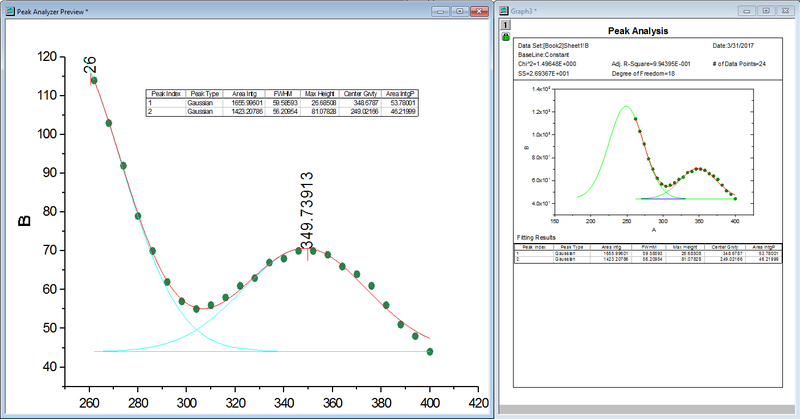 With the graph activated, select Analysis: Peaks and Baseline: Peak Analyzer….to open the Peak Analyzer wizard. On Goal page, select Fit Peaks (Pro) as Goal. Please note that Fit Peaks only exists in OriginPro. 2. Click Next button. On Baseline Mode page, set Baeline Mode to Constant, Y= to Minimum, Click Next button. 3. On Baseline Treatment page, check Fix Baseline Parameters checkbox so the baseline will be fixed during fitting. Click Next button..
4. On Find Peaks page, first uncheck the Enable Auto Find checkbox. Then click Add to manually select peak locations. Double click around x=260 to add a peak. Double click around x=350 to add the second peak. Click Done. You will be sent back to Find Peaks page. Then under Peak Fitting Bounds node, set Preset Bounds by to “By Difference” and turn on only Center check box and set a value of 15. This way, during the final fitting stage, the peak center will be limited to within +/-15 of picked position. Click Next button. 5. 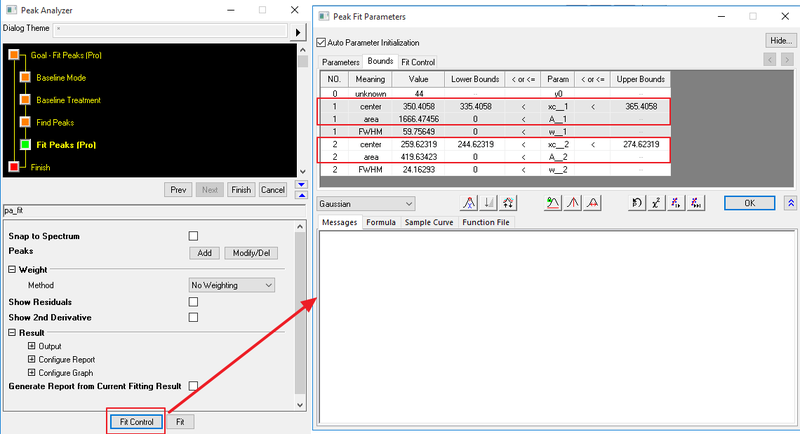 On Fit Peaks page, click Fit Control button to open Peak Fit Parameters dialog. Go to Bounds tab, you will see the lower and upper bounds are applied. 6. Let’s also set area of two peaks to be larger than 0. Double click < or <= cell of A__1 row twice so < shows. Then set Lower Bounds cell of that row as 0. Do the same A__2 row. Click OK. Then click Fit button. 7. Click Finish to generate fitting results. The success of peak fitting is largely determined by the initialization of peak position and bounds set on peak parameters such as peak center, area and width. If the approximate peak location is known, even for partial peak data, one can achieve optimal peak fit results using the Peak Analyzer tool.